"Les vacances des rois" (holidays of kings) TV campaign for 2017 to 2018. For this second TV campaign, the Yelloh! Village group has entrusted advertising agency Blue Egg with producing its new "holidays of kings" TV ads. With a quirky touch of humour, Stéphane Bern is back as representative of Yelloh! Village for telling us about camping holidays that are fit for a king! In these advertisements, all the actors are dressed in regal costumes, with lace trimming, crinoline dresses, wigs and silk clothing. "Holidays of kings" are what happen with Yelloh! Village, and are enjoyed to the lively sounds of Mel Brooks' timeless and hilarious blockbuster "Oh yes it’s good to be the King". So with these French adverts broadcast since January 2017, the Yelloh! 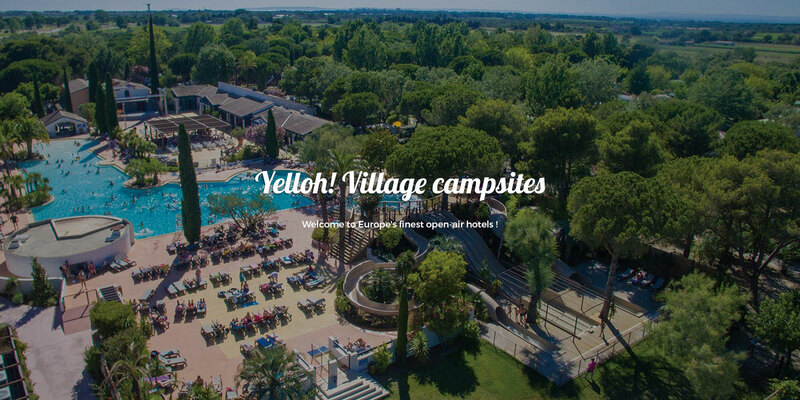 Village campsite chain is once more showing itself to be a major force in the camping sector, with a strong, top-end identity. From January to July 2017, these adverts have been shown in France on M6 and several DTT channels (C8, W9/6TER, TMC, NT1, CSTAR, Gulli, HD1, RMC Découvertes, Paris Première, Série Club and Teva). From January to July 2018, these ads are being shown in France for the first time on TF1 and several DTT channels which share the group's target audience (C8, W9/6TER, TMC, NT1, CSTAR, Gulli, HD1, RMC Découvertes, Paris Première, Série Club and Teva). In 2019, Yelloh! Village is sponsoring the France 2 television series “Un Si Grand Soleil” in January and February, followed by 3 classic advertising campaigns from March to June to be broadcast on TF1 and several French DTTV channels (W9/6TER, C8, CSTAR, Gulli, RMC Découvertes, RMC Story, Paris Première, Série Club and Teva). For the first time, Yelloh! Village will also be present on Dutch television as sponsor for the weather forecast on RTL4. The first campaign on French TV by the Yelloh! Village group was broadcast over a 3 year period, with three ads produced by advertising agency Publicis Marseille. Headlining is our delightful representative, Stéphane Bern, who we see enjoying his Yelloh! Village campsite holiday. A game of volleyball, a little barbecue with friends or a bit of time spent in the Jacuzzi: these are what Stéphane Bern calls "holidays that are fit for a king". These ads were broadcast from 2013 to 2016 on M6 channels (M6, W9/6TER) and on France 2. Since 2012, journalist, radio DJ and TV presenter Stéphane Bern, who specialises in royalty and royal families, is the star for Yelloh! Village. Choosing this public figure is intended to cater to the changes that the group has introduced over the past few years: even more comfort, even more facilities and even more glamour! Camping with Yelloh! Village is increasingly high-end! The group therefore deserved a valuable representative who is universally recognised, so as to proclaim the image and essence of these campsites loud and clear. A representative able to embody the values of excellence, sincerity, generosity and a demand for quality, whilst providing a refreshing and kindly image.